Back when I was a kid, my parents made sure to keep me attentive to my manners. I fought them on one of their teachings. I didn’t see the sense in putting my napkin in my lap. Some friends took the risk of inviting me to a New Year’s Eve dinner party. A real dinner party – four couples at the table, silverware, china. Each of the four courses were successively more delicious than the last. Being invited to this event was a treat; the experience just skyrocketed from there. So there I was, at this perfectly set table. The courses started with a delicious lentil soup. A crisp salad followed the soup. When the soup came out I took my napkin from the napkin ring and put it on my lap. That’s what my folks taught me to do. I did it, even though I couldn’t see the napkin. Let’s pause here to address those of you who are snickering. For your information, I do know people who own napkin rings and they know me as well. Despite knowing me, they do invite me around. That is your lesson for today – people who own napkin rings are risk takers. Now let’s get to my lesson. The main course arrived after the salad plates were cleared. In short order, though the hostess was anything but a short order cook, I had a full plate before me. My napkin ring owning friends didn’t realize that they were at their highest level of risk at that moment. With my plate in front of me, I moved a serving dish of broccoli. I overturned my plate in the process and it emptied into my lap. Broccoli, carrots and half of a twice baked potato landed on me. The last thing to land was a serving of perfectly prepared fruit-stuffed pork roast. Down came the pork roast. And as exquisite as it was, it did not feel nearly as good in my lap as the potato. The embarrassment I felt from the sound of the plate emptying its contents over the side of the table cut through the delightful warmth of the potato in my lap. All I could say was “that’s unfortunate”. Yes, “that’s unfortunate”. When you live as I do you know just what to say when you’ve got pork in your lap. But then I realized the value of my parents’ tutelage. Every bit of food landed on the napkin on my lap. The perfect pork, the snugly warm potato. 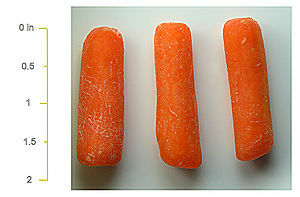 Even the carrots, who are known for their ability to escape, were all captured on my napkin. There wasn’t a mark on me. I was able to resume the meal with minimal fuss; with my clothes unsullied by even a sprig of parsley. Thank you, Mom. Thank you, Dad. I’m now modifying my position. Seeing the napkin is not as important as I’d thought. Thank you to my napkin-ring-owning, risk-taking, relatively new friends for a fantastic eventing. The food was amazing. I enjoyed the company. And that potato felt good. You have to be concerned however as to whoever who rolled that napkin if they wash their hands after a visit to the bathroom. You’ll know as I did if you wake up in the middle of night with emissions coming out of upper and lower orifices in your body. That would be all sorts of bad. These were top notch folks who are both hygienic and friendly. There was a time that potatoes were used in that fashion (as warmers) and it was perfectly acceptable. Baked potatoes could be placed between bedding to warm up your bed before retiring. Or you could just hold one in your hands to warm them. The bonus is that there are always leftover potatoes for homefries. Anything that results in home fries gets my vote. I’m. Just. Speechless. Kudos to your friends for not making you feel worse than you probably did! Glad everything worked out well — by the way, I’m not sure napkin-ring folks are risk-takers as much as they are nonjudgmental! Well they certainly proved your point on being non judgmental. They were so nice about it. I was wondering if you happened to tuck the napkin into your pants or if it was just draped across your lap. i recall an embarrassing moment about 20 years ago that involved a waitress chasing a patron into the parking lot to retrieve a napkin, so I understand the risks. curious to know if that may have been the saving grace in your case, though. I wish I had done that. I could’ve tucked the last two corners in after I dumped my plate and then had a to go order. Big fan of that gentleman. I’m sending you warm baked potatoes next year for Christmas. Perfect. I’m a butter guy, don’t worry with sour cream. Good. More sour cream for me. No cheese? I’m all butter, all the time. If you were so in love with a napkin and wanted to spend the rest of your life with it, would you purchase an engagement napkin ring for it? I’m just asking for a friend. They say if you like it you should put a ring on it. Maybe everyone should have 2 napkins. One for the lap and one to wipe hands and mouth with. I’m in favor of that. Safety and convenience. What’s not to like. Eat it! Don’t wear it! I’ve always felt like the napkin in the lap thing was pretty strange too. Glad to hear I’m not alone in the world! Or maybe I think ties should be napkins. I have a position of some sort. Ties are just decorative nooses. Someone thought it would be a swell idea to put men on leashes. If the purpose of the napkin is to catch the stray food that falls off the table, it would make more sense just to put another plate on your lap. I like it. A plate, with something shaped like a shark fin to hold it in place. Very smooth move, Oma. 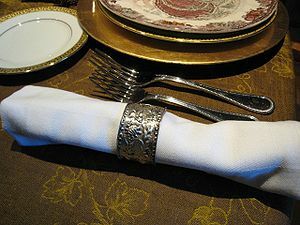 I have a lot of napkin ring dinner parties but quite often the guests end up tying the napkins into do-rags after dessert and looping the rings somewhere inappropriate. You can’t teach smooth like I have. I should start attending more dinner parties as entertainment. Can I come over? Sometimes mom and dad really do know best! More often than not, they do. It usually takes decades to realize that, doesn’t it? It all works together; having a napkin ring without a cloth napkin is just not done. A paper napkin in your lap, even a really nice paper one, would have failed you miserably. My grandfather always had a cloth napkin in a napkin ring at the table when he was enjoying his morning breakfast of a hard roll and slice of cantaloupe. I’ve always thought napkins were to be tucked into your shirt collar . Not so ? I guess you were taught different manners . As for the risk factor —- I’m too anxious to take the chance , especially with carrots . I think you were just lucky , though . Don’t be too secure . Maybe it was just a fluke that it all landed in the napkin . One time . Thank goodness you’re clothes were unsullied. I just like that word! I like rings on my napkins, too, but unfortunately I do not own any. Can I still be a risk taker? It sounds like a delicious meal. What wonderful friends you have. The ad playing at the end of your post is for wipes. I like to imagine that this story ends with you calmly placing the plate in its spot on the table, setting the food-filled napkin on top of it, then yanking the napkin away with a magician’s flourish, leaving the pork, potatoes, carrots, etc. arranged neatly on the plate.